Facing a wall put your hands against it at about eye level. 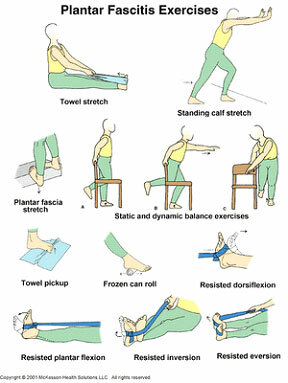 Keep your injured leg back with your heel on the floor. Keep the other leg forward. Turn your back foot slightly inward (as if you were pigeon-toed) and slowly lean into the wall until you feel a stretch in the back of your calf. Hold for 15 to 30 seconds and then relax. Repeat 3 times. Stand with foot back, both knees bent and keeping the heel on the floor, turned slightly out. Lean into a wall until the stretch is felt in the lower calf. Hold for 15 to 30 seconds and then relax. Repeat 3 times. Sit on a hard surface with your injured leg stretched out in front of you. Loop a towel around your foot and pull the towel toward your body keeping your leg straight until you start to feel a stretch in your calf muscles. Hold this position for 15 to 30 seconds and then relax. Repeat 3 times. Stand with forefeet on raised surface, as if doing a backdive off of a diving board. Raise up onto your toes, then return to standing position. Next, let your weight take your heels down below the level of the surface so that the back of your calf is stretched. Hold each position for 10-15 seconds. Repeat until calf is fully fatigued.